This page is written by the game's inventor, Carlos Cetina. The hexajedrez word is a neologism. Chess in Spanish is said "ajedrez". 1) Here the central pawns may also step two orthogonal cells at its initial movement. 2) Castling is made as usual in chess: king two steps toward the rook. 3) The Bishops Conversion Rule is applied to those placed on hexagons of a same color: e3 and g2 for White; e10 and g9 for Black. The conversion is made by moving one orthogonal step to any of the three red hexagons that surround to e3, g2, e10 and g9. Play Hexajedrez at Game Courier. Click on the above link to view logs of Hexajedrez played on Game Courier. Two queen per side makes for a rich variant, though perhaps my bias as an orthodox chess player goes against it (in that game a king starts with one queen, or wife, though it's possible he may become a bigamist later in the game). My more real concern with this variant is that after a very early bishop's conversion by White, both Black pawns that are guarded in the setup only by the rooks can come under a double attack. For Black to defend or counterattack against this possibility (also a similar story for White, if he starts less aggressively [perhaps]) seems to limit his choice of responses for tactical reasons (i.e. to avoid losing at least a pawn for more or less nothing, perhaps), and that may make the opening possibilities in the early stages less rich, at least for Black. However, Shogi suffers from a certain lack of variety in the early stages, as far as the best moves go, and yet it is a classic. All in all, I think Hexajedrez promises to be a successful variant, if it were tested more, by skilled players especially. I certainly like that there are significantly more pawns in this variant than in McCooey's Hexagonal Chess (actually the same number as in Glinski's Hexagonal Chess, which uses different pawn rules). For what it's worth, decades ago I saw the following piece values for Glinski's, which ought to also be applicable to this variant (as well as McCooey's): P=1; B=3; N=4; R=5; Q=9. I would add that I tentatively estimate the fighting value of K=4 approximately (though naturally it cannot be traded). What about swapping one of the bishops with a one of the queens to arrange bishops in such a way that they're cover all colors? 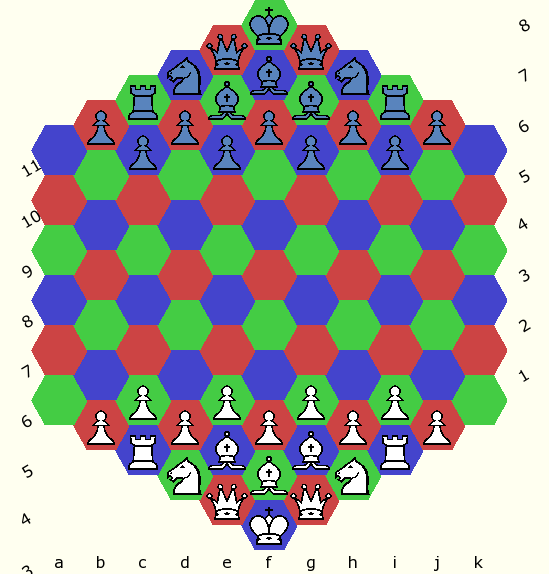 Suggesting that because in this setup there are two bishops on the same colors. Or could you explain why there is such placement chosen?